In the mythical existence of the ‘Lyric Laureate’, songwriters would have to clamber over Danny Schmidt to claim the mantle. Few contemporaries are the equal of this Austin Texas native and each album released unveils a deluge of lyrical delight for song junkies to dissect. If no further inspiration was required for a brand new record, the birth of a new child to Schmidt and fellow song writing wife Carrie Elkin suggests to have provided rich accessible pickings for fresh material. You do not have to wait too long for this influence to blossom as ‘Just Wait ‘til They See You’ articulates a sense of renewal in the first track of a new album, poignantly titled STANDARD DEVIATION. From the moment this opening song flexes its muscles with lines such as ‘I’ve seen the redwoods and northern lights, just wait until they see you’, you are in the grip of hypnotic writing delivered exquisitely by a perceptive tune melody. Schmidt’s previously album OWLS rolled out to a similar impact in 2015, but you get the feeling that STANDARD DEVIATION moves the gauge along a little further. This view is propelled forward with the most powerful of album closers as the topic of ‘miscarriage’ or more precisely the language applied, is tossed into the open forum under the subtle title ‘We Need a Better Word’. Only a Danny Schmidt album could start on the right foot and conclude anchored to the left. The build up to this emotive finale comes in the guise of a frank view of family life in ‘Bones of Emotion’. A song that concludes a trio of tracks which lift the record into a higher stratosphere in the second half than reached in the first. Forming this chain of tracks are the catchy earworm number ‘Last Man Standing’ and an equally infectious piece of song writing detailing the Jefferson Highway (a road from Winnipeg to New Orleans) in ‘The Longest Way’. In these two tracks, the sound saunters into the realm of country music, partially inspired by the presence of fiddle in the former and visions of Johnny Cash in the latter. A country sound is also detected in ‘Agents of Change’, in contradiction to the ‘that very’ urban theme of gentrification inspiring the track. Consensus would label Danny Schmidt a folk singer, and he lives up to this tag midway through the album with ‘Newport ‘65’; a track leaving very little to the imagination with words like ‘prophet’, and ‘shepherd’ joining blasts of harmonica alongside a little folk music commentary. Linking the theme of meaningful writing, the irony of the track ‘Words are Hooks’ is not lost as it takes the nous of a master words craft person to ponder the power of language’s key component. 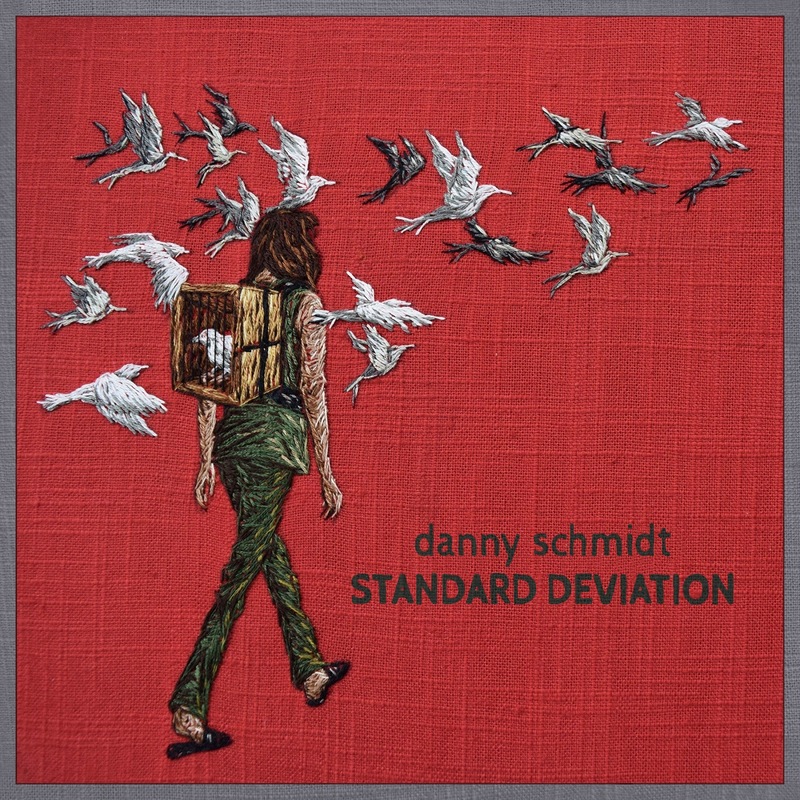 It would not be a Danny Schmidt album without at least one head-scratching track and the title piece ‘Standard Deviation’ excavates deep into a swirling world of mathematics and possible metaphors for love. As much as songwriters like the listener to get the message, pleasure can too be derived from twisting words into own interpretations. While not pushing the album’s heavyweight tracks, the gorgeous tones of ‘Blue Eyed Hole in Time’ warrants the final word, not least in the general feel of optimism that surrounds the record, despite some of the darker moments. Maybe a repeated theme of the newborn in the last mentioned track plays a part in this summation. 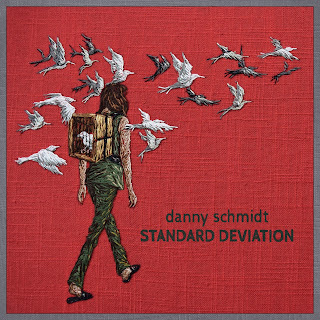 The poetic virtue of STANDARD DEVIATION makes this album another valuable addition to the ever-widening Danny Schmidt back catalogue. Sometimes we just have to celebrate having him in our sphere of listening and be thankful that songs can accrue so much pleasure in this format.